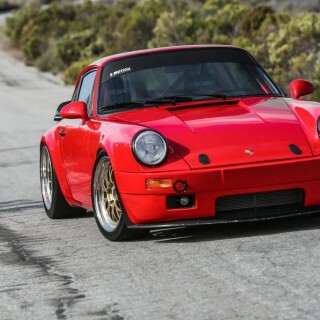 For more and more young classics, classic cars and historic cars we develop adjustable dampers and coilover kits. 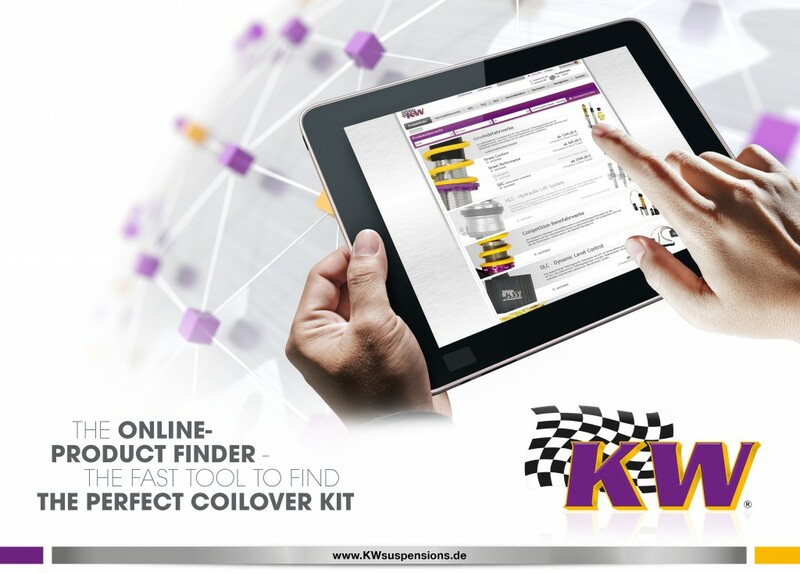 For the Mercedes-Benz 190 (W201), offered between 1982 and 1993, we now have a KW classic suspension kit available. Back then the Mercedes-Benz 190 was the first sedan that the automobile manufacturer has developed with a modern 5-link rear axle. The front axle was designed without a MacPherson-construction. For this reason, also at the front axle, the struts and the helical springs of the KW Classic suspension kit are a separated, or divorced setup. So, on the W201, the continuous lowering on the drive axle as well as on the front axle is directly adjusted via the height-adjustable spring perch. Many fans of young classics not only decide to get a KW classic suspension because of the possibility of a continuous lowering, but they also want an improvement of ride quality and driving dynamics. 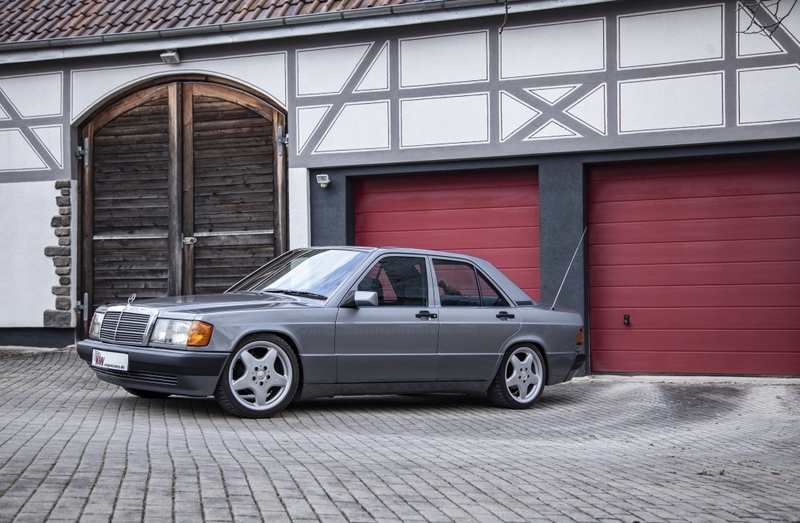 A Mercedes Benz 190 (W201) upgraded with a Variant 3 kit, benefits from the modern KW damper technology. So the sedan hardly rocks over the longitudinal axle even with a comfortable driving behavior and it hardly nods over the lateral axle during acceleration and braking. This positive driving characteristic is possible by the two-stage construction of the compression and rebound valves in the KW dampers. 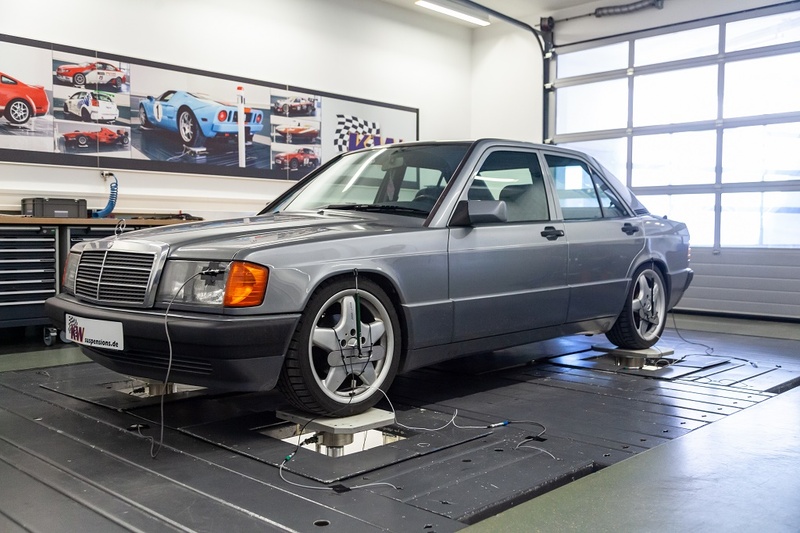 A Mercedes Benz 190 equipped with a Variant 3 is driving much more dynamically than with a suspension that was considered state of the art more than 35 years ago. 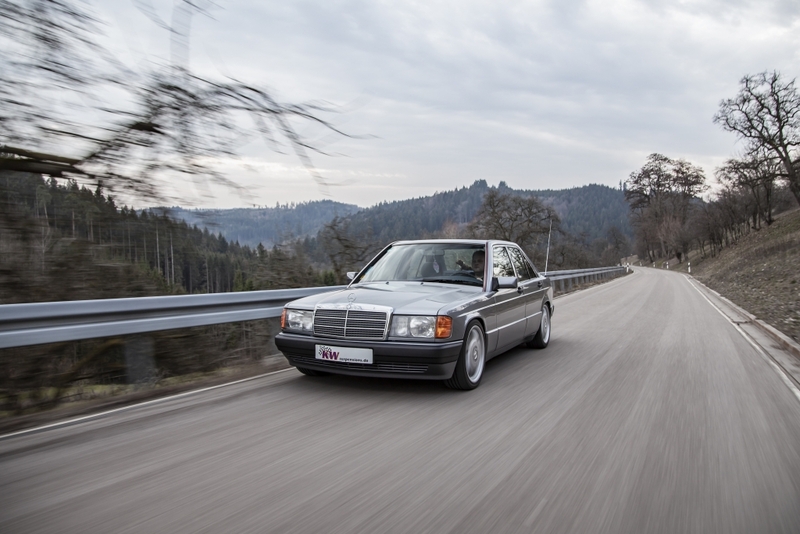 The Mercedes Benz 190 – drivers get the suspension technology of the Mercedes Benz AMG Black Series models, so to speak, with our KW classic suspensions. 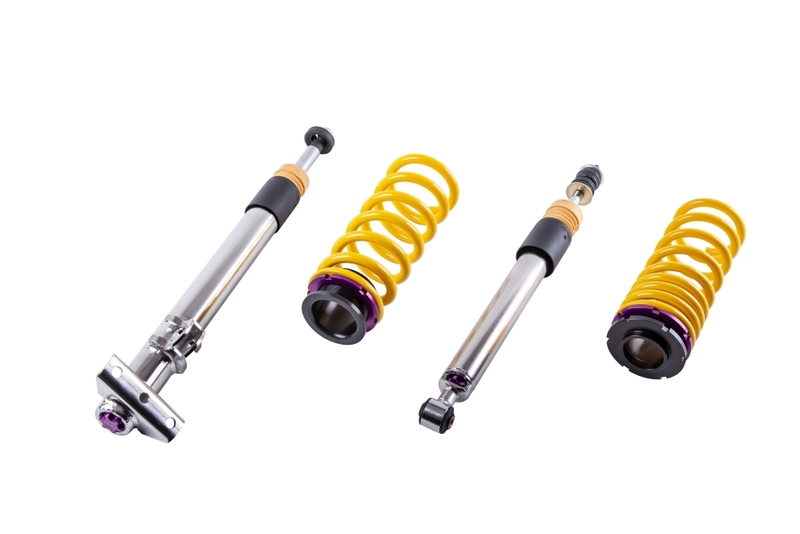 KW adjusts the recommended basic setup of the KW suspension as stiff as necessary and comfortable as possible. 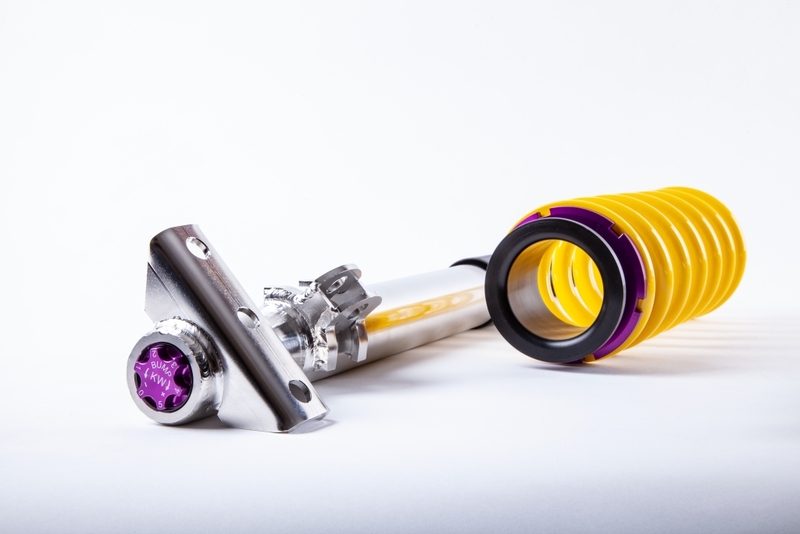 While the valves cannot be further adjusted in their high-speed characteristics, all drivers have the option to further adjust the dampers individually in the low-speed range. So, the rebound stage that is relevant for the handling can be configured with 16 clicks either stiffer or more comfortable. For the compression stage, to support the body structure, a personal suspension setup can be selected with twelve exact clicks. On poor roads or when driving over speed bumps, the pre-configured high-speed valves ensure that the damper valves open all channels within a split-second and this way the harshness of the uneven road is diminished. The lowering can be adjusted on the front axle from 40 to 65 millimeters and between 35 and 60 millimeters on the drive axle. Please dial your Mercedes-Benz 190 (W201) at our website www.kwsuspensions.net and you can order the KW Variant 3 classic suspensions direct in our factory in Germany.